Forecast models have been hinting at a low developing in the deep tropics. A spin is now noted on satellite imagery near 12° N / 35° W or about 1700 miles west of the Lesser Antilles. Forecast models take this low northeast of the Lesser Antilles as it recurves northeast around the break in the ridge. A very large unseasonably strong trough on the east coast this weekend should continue the recurving trend well east of the states. Remember, we are simply in recon mode on this one. This is no time to panic or cancel travel plans. The "L" on the satellite imagery denotes a spin center and not a formed tropical depression. 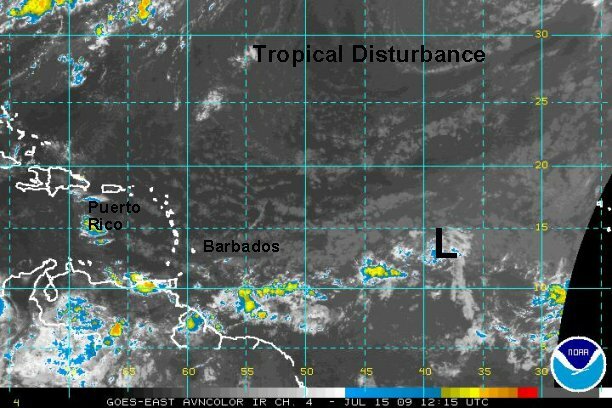 The sharp tropical wave is centered near 13° N / 39° W or about 1400 miles east of the Lesser Antilles this morning. Visible satelite imagery shows that the limited convection if anything has faded. Models develop the feature some, then weaken it before arriving near the Leewards this weekend bringing increased rain chances. We will continue to follow this sharp wave since forecast models are still a little showing some development. However, this will be the last update unless there is actually increased development. This is no time to panic or cancel travel plans. 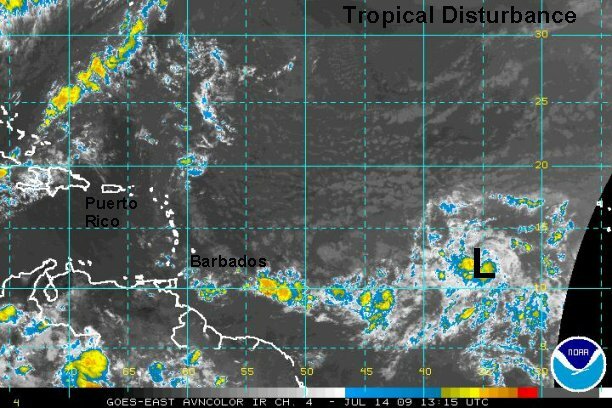 The "L" on the satellite imagery denotes a spin center and not a formed tropical depression.